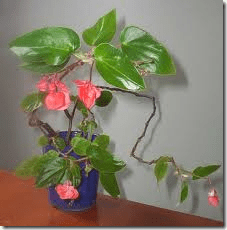 What Do Wax Begonias Need to Survive? Wax begonias are a hardy, low-maintenance flowering annual that bloom from spring planting until the first hard frost. Because they do well in all but the coldest and hottest conditions, they are a popular and colorful choice of gardeners in many areas of the country, either as a bedding plant or in containers. Wax begonias are annuals that sport pink, white or red blossoms. The shiny, silky-looking flowers sprout up in bunches from leaves that are bright green or reddish-brown in color. Plants with either leaf are equally hardy, so gardeners just have to decide which one they like better as a backdrop for the showy blooms. Wax begonias will not survive frost and should not be planted outside until all danger of it has passed. The plants will tolerate heat but will struggle when the temperature is above 90 degrees for long periods of time. They like light and so can be planted in full sun or bright shade, but there is a limit to just how much light. Do not plant them in a location where they will get more than five hours of direct sunlight a day. New varieties have been developed that will thrive in locations that are in shade all day long. Wax begonias need rich soil with a pH level of between 6 and 8. The soil has to have good drainage and should be loosely packed so the roots are not crushed. Water them until the soil is completely wet, then give them time to dry out before watering again. The top inch of the soil should be completely dry before another watering because the plants will rot if they get too wet. Fertilize the plants every seven to 14 days with an all-purpose, water soluble, quick-release fertilizer for flowering plants. Wax begonias are relatively free from diseases and infestations of bugs. However, they can develop a fungus, usually in humid climates or early in the planting season when the difference between daytime and night-time temperatures is the greatest. Left untreated, the fungus will make the leaves of the wax begonia curl up, dry out and fall off. The fungus looks like a white powder that settles on the leaves and flowers. The best way to prevent it is by controlling the level of humidity and temperature swings to which the plants are exposed. If the fungus still appears, it can be treated with a fungicide available at gardening supply centers. The treatment works best if applied when the fungus first appears. Wax begonias can thrive indoors over the winter or all year long. They will do well in containers with good drainage filled with a potting mix of peat moss and vermiculite. They should be watered until the soil is completely moist, then allowed to dry out before they are watered again. Wait until the top inch of the soil in the container is dry before re-watering. They also need good lighting and will thrive when placed under fluorescent bulbs. If artificial light is used, plan to give the plants about 12 hours of exposure to it every day. They also can grow in a window with natural light, as long as there is not so much that they burn or so little that they grow at an angle to try to reach the light source. A window with a southern exposure is best when growing begonias indoors.